Enameled cast iron cookware is comparable to stainless steel in terms of its non-stick characteristics. It is safe to use with acidic foods and has a high heat retention due to its thickness and generally awesome cast iron qualities. Additionally, these skillets are also safe to use in the oven, on all stoves and on the grill. I would slightly hesitate to use the really ornate, pricy cast iron out on the barbie due to the risk of damaging the somewhat delicate, glossy coating. 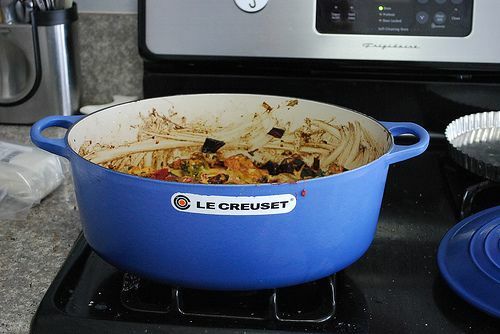 Enameled cast iron is also heavy which may be a positive or a negative depending on if you have other plans for the cookware such as protection against an intruder. 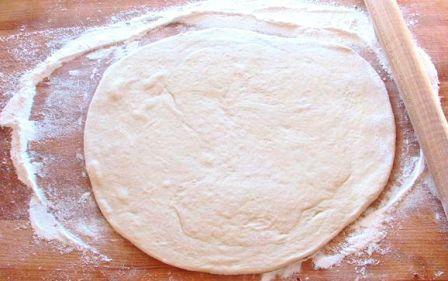 If you don’t have a sandwich or panini press you can use a preheated dutch oven or skillet. 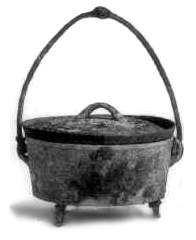 Enameled cast iron also has a lower thermal conductivity when compared to simple cast iron; many chefs use the time it will take to heat up an enamel cast iron Dutch oven and complete other tasks in the meantime. These skillets are also more expensive than traditional cast iron, particularly when you compare well-known brand names, like Le Creuset. However, if you can find these skillets at flea markets, thrift stores or from an aging relative, you may be able to save some money. Even Lodge had gotten into the enameled cast iron game, and who could blame them with the prices of some of the imported pieces. The quality is no doubted high to exceptional but if you’re on a budget then the price tag may make you reconsider. Additionally, the pans and pots vary in their knobs, handles and shape, but you can often order replacement knobs for a dollar or two; your off-brand, never-heard-of-before skillet can now be safely used in the oven. Avoid using metal utensils in enameled cast iron; it is possible to chip the coating. However, should such a situation occur, simply season the pan again. You are only exposing the cast iron; that doesn’t mean you cannot use the pan anymore. 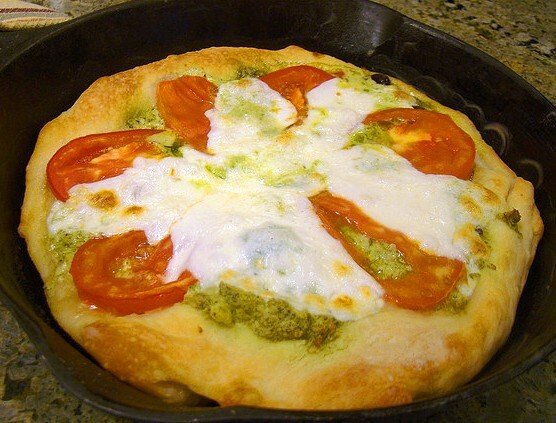 Enameled cast iron will not hold flavors as readily as a traditional cast iron skillet. This is really a positive and a negative. Let’s say I’ve just fried some catfish in my cast iron skillet – Yum Yum! Let’s say I want to make some pine apple upside down cake the very next day. I think you can see the point. It’s certainly not a deal breaker for the bare cast iron but I think it’s clear that the enamel coating could be handy in some cases. Bare, uncoated cast iron is relatively cheap compared to traditional cookware and enameled cast iron. In fact, some lucky chefs can inherit cast iron skillets from their grandmothers and great-grandmothers because cast iron dates back to the 5th century BC. 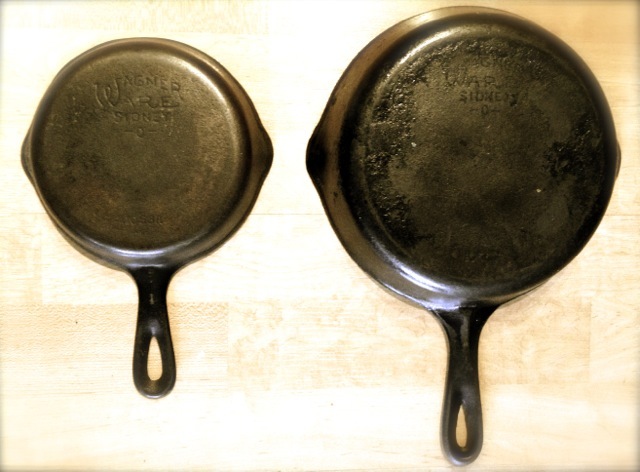 While you may not have a pan quite that old even though your grandmother may resemble otherwise, cast iron cookware is sturdy and can last for generations. 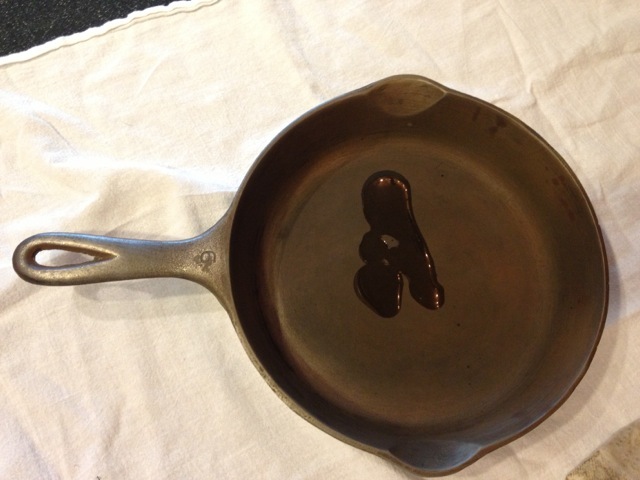 Some people consider, the author included, the older, vintage cast iron pieces to be superior in quality and the antique stuff just gives you the warm and fuzzies too. Cast iron, when properly seasoned, is the original nonstick pan. Many veteran chefs and beginners alike agree that it is the best type of cookware for searing and blackening. 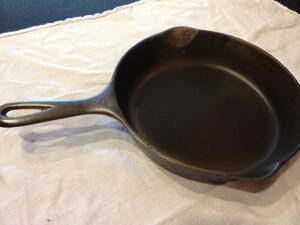 Even if you simply need a pan to use under the broiler or a good weapon to guard against an intruder, nearly everyone should own at least one sturdy cast iron skillet. 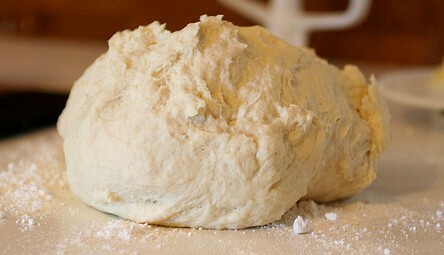 It’s pretty much a staple in the American kitchen and for good reason. 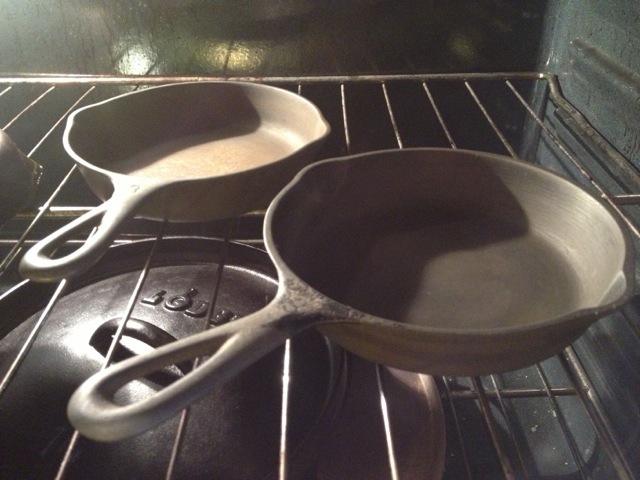 Bare cast iron can help to evenly deliver heat more efficiently as the result of the unique radiative properties of the dark metal. 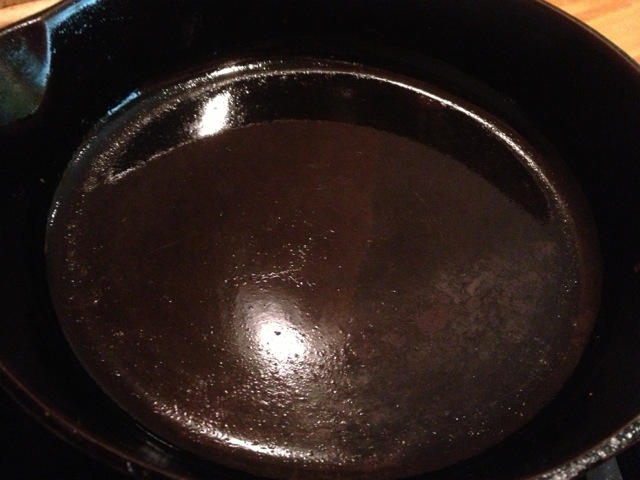 Additionally, if you have an iron deficiency, bare cast iron can help to add extra iron into your food. This is an important thing to consider to help get the trace elements that are needed, especially if you or anyone in your family suffers from Iron deficiency anemia. It isn’t just an tale that your grandma told you – the Journal of Food Science conducted a study with the results published in 2006. The amount of iron (Fe to the chemistry folks) varied greatly based on the acidic pH or organic acids but the food contained significantly more iron than food cooked in anything else than uncoated cast iron. 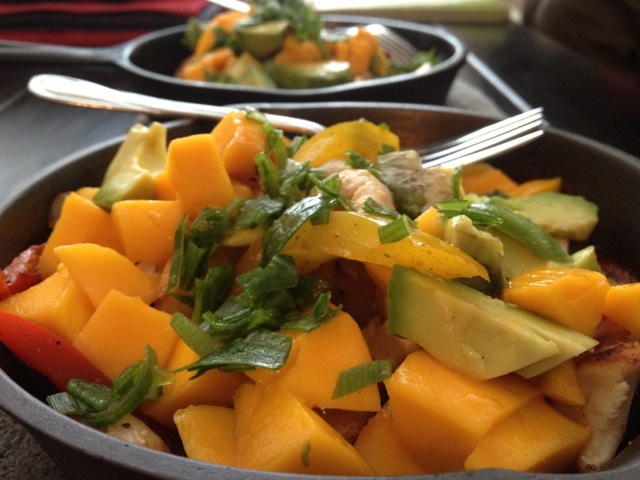 We try to cook on cast iron 3-4 times a week around here. However, while a heavy cast iron pan can help you to protect your home in the middle of the night, the skillets are fairly heavy to lift. These pans must be seasoned and should rarely be used to cook acidic foods because the acid can wear away the seasoning to the point where the food will come into contact with bare iron, causing a reaction. While it is always fun to experiment with new flavors, you may not want to taste metal when you are sitting down to dinner with your family. Moderation is key to the acidic food – I make a chili in my dutch ovens every now and then but don’t do it everyday or let it simmer for more than 3-4 hours. I would skip the pasta sauce (Sunday Gravy) if you’re planning on simmering/braising for many, many hours. 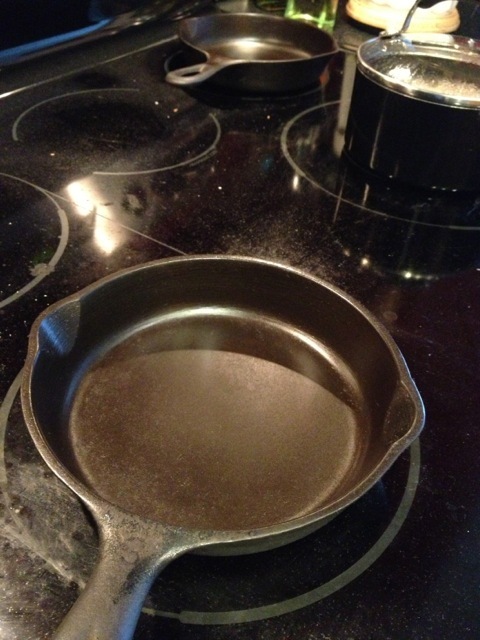 If you do not treat cast iron with care, you risk shattering or cracking the skillet. Avoid placing the pan in water while it is still hot; the temperature difference can damage the skillet by warping or cracking it. Additionally, use caution if you have a smooth, glass top range; you risk scratching the service, making it more difficult to clean. I have a glass top stove myself and we haven’t had any issues so just be careful and I think your stove will be okay. These skillets also have the potential to rust and have a low thermal conductivity; it may take a while to properly heat up a pan to cooking temperatures. The low thermal conductivity has a plus side since the pan will stay hot for longer. This is why they serve fajitas on cast iron; the hot, searing metal keeps the food hot while you’re stuffing your face full of tasty Tex-Mex. If you are searching for a cast iron skillet, inspect it to make sure the handle is usable; a pan with a stubby handle will cause nothing but headaches when the time comes to cook. It wouldn’t be unusable but you may need to task it with other jobs aside from typical skillet tasks – maybe use it as a deep dish pizza pan…? 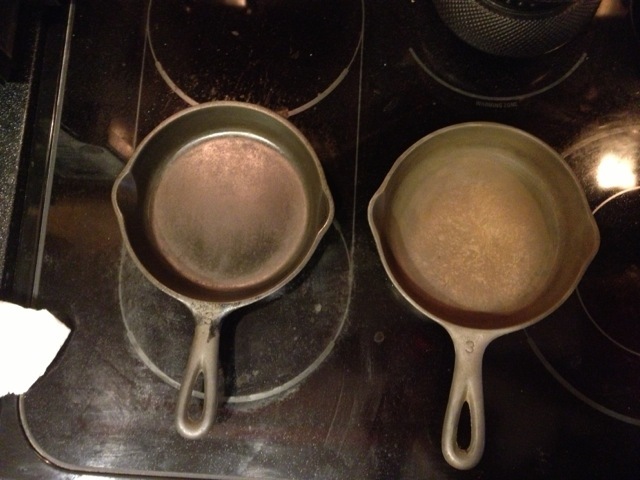 Enameled Cast Iron vs. 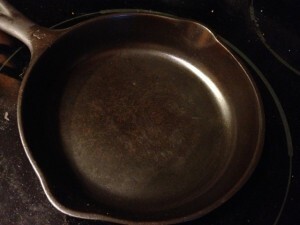 Cast Iron – Who is the Winner? 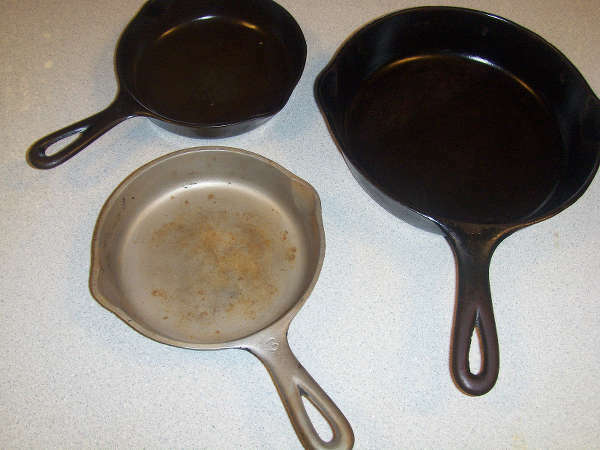 Both enameled cast iron and bare cast iron have positives and drawbacks; if you are in the market for new cast iron cookware or an enamel cast iron Dutch oven, it is vital that you do your research to determine what type is best for you. 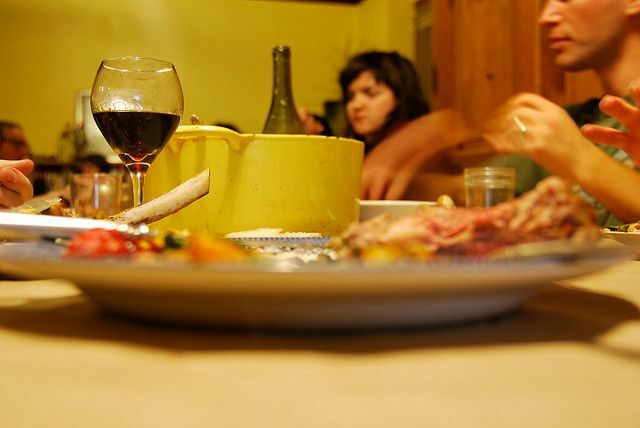 However, if you aren’t picky and you are on a budget, start hounding family and friends to see if anyone has an extra skillet that they are not using or scout out nearby thrift stores and garage sales to score the best deals. Regardless of what type of cast iron you choose, you will be able to cook with pans that have been around for centuries. Just get one of each…They both have their place in your kitchen. If you pressed me, I would go for the bare, naked, uncoated, unadulterated cast iron. It think it has the edge in durability. What Next? Do you already have your cast iron and wonder what you can cook with it? Check out our recipes section! Photo Credits to fowler&fowler at wikimedia commons and parityytirap, johnny.hunter at flickr.